The preeminent Jamaican producer Donovan 'Vendetta' Bennett a.k.a. Don Corleon presents his latest roots riddim project entitled 'The Message'. The riddim itself is a pleasing, pulsating one-drop, with a classic Corleon acoustic guitar riff and a very welcome string arrangement. The title is most appropriate, with all but one of the tracks expressing a conscious, positive vibe or 'message'. Included in the set are Corleon regulars Jahvinci, Da Professor, Pressure, and Protoje. Da Professor, citing the 35th Psalm, offers a tried and tested solution to problems as he encourages listeners to "pray, pray, pray, pray, pray" on the track Words. Jahvinci puts forth an excellent effort with the inspiring Wicked Heart, a tune assuring that the Almighty is there if we seek him and that the wicked will soon perish. "Put your trust in Jah... he'll never make your heart break...he'll never hurt your feeelings" sings Jahvinci. Pressure Bus' Pipe lends his skill to the project with the anthem-like Jah Love. He continues to hone his talents with an adept display of singing and deejaying. Pressure is one of a very select few that is equally accomplished at both. Protoje's smooth-flowing delivery rides the riddim precisely on the big tune Take Control. Corleon adds a nice touch on the mix by breaking down the riddim at certain intervals to beautifully accommodate Protoje's rapid-fire delivery. Veteran Richie Spice lends a solid, conscious tune to the riddim with Got To Make It. He's in fine form as he admonishes one and all to have confidence in themselves if you want to make it. It's all about self-motivation and putting your best foot forward in order to meet with success. Ky-mani Marley continues to show that he and Corleon are a wicked combination on Brave Ones. Indeed, if what he's produced thus far with Corleon is indicative of his forthcoming album then the reggae world better hold tight because it's bound to explode! Swedish sensation Million Stylez makes his debut with Corleon on the forward-thinking Brighter Day. "No matter how the heathen a gwan...pray fe a brighter day. From afar me a see dem a come...pray fe a brighter day...better mus' come." Hope springs eternal. The ladies are well represented also with Cecile taking top honors on the culture track Rise Up. Also included in the set are Ikaya with Flyaway and Sophia Squire with Love. Newcomer Vital, sounding like a cross between Jah Cure and Lukie D (A huge compliment! ), breaks the 'message' mold with a romantic ode to his lady on Don't Say No. Vybz Kartel closes the set with a denunciation of government and politics while highlighting the everyday struggles of the people on the classic Poor People Land. Kartel is a talent! No question. Adidjah....can you please do more like dis ya one? A big tune dat! 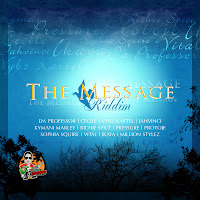 The Message is yet another quality riddim from Don Corleon. He continues to show why he is one of the top producers in the business. True, his roots productions all share a common sound and feel. But what's it really matter when that sound and feel is world class?! Highly Recommended!